Leigh Vaughan cable identifier is the industry standard tool for all Electricity Distribution Engineers, Cable Fault Location & Jointers forming an essential part of their equipment when reliable high voltage cable identification is needed, including 11kV and 33kV. The cable identifier is a well proven and reliable instrument for the positive identification of high voltage power cables prior to cable spiking or commencing work on de-energised cables. The tool is particularly beneficial in situations where one of several cables in a location requires identification. 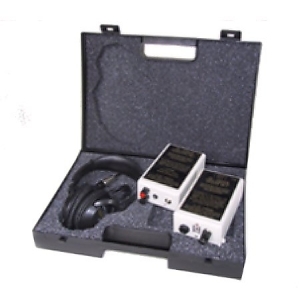 Leigh Vaughan Cable Identifier consists of a sturdy plastic carrying case foam-fitted to house the transmitter, receiver and headset. The transmitter is in a strong plastic case with spring loaded output connection terminals. Power for several hours use is by 4 AA cells (HP7) that are readily available and easily fitted. The transmitter emits an interrupted signal that when fed into the cable can be picked up by the receiver at the identification point. When the unit is in operation a red LED flashes at the interrupt frequency. The receiver is housed in a similar case to the transmitter and requires the same type of battery. It contains a coil for signal pickup and an amplifier with gain control for the meter and headset. To help to conserve battery life an interlock is arranged to disconnect the battery when the headset plug is removed from its socket. The cable to be identified must be discharged to earth and ‘dead’ before using the Leigh Vaughan Cable Identifier. The principal of operation is to attach the transmitter at one end of the dead cable, and at the remote end the cores on which the transmitter has been connected are shorted together. At any point along the cable the transmitted signal can be picked up by the receiver, and the cable identified. The Electricity Supply Safety Rules should be observed when using this instrument. Key Products : MV Joints & Terminations, Cable Cleats, Cable Connectors, Duct Seals, Cable Transits, Underground Cable Protection, Jointing Tools, Feeder Pillars, Cable Duct, Earthing & Lightning Protection, Electrical Safety, Cable Glands, Arc Flash Protection & Fusegear.